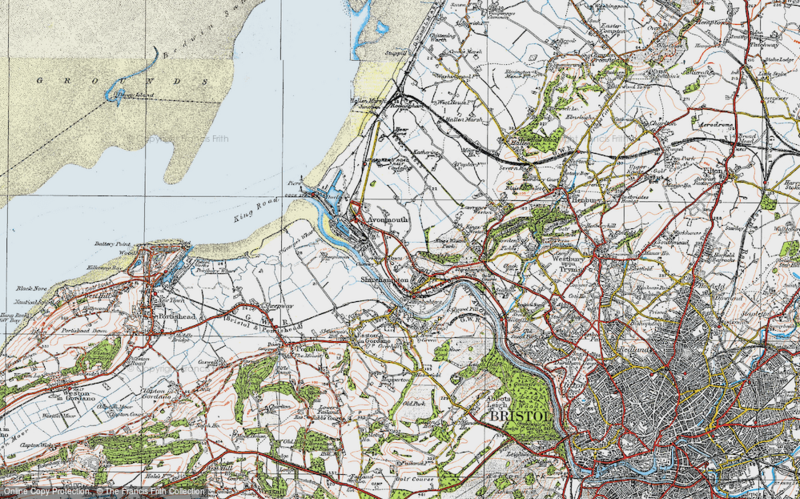 Buy this map of Avonmouth as a print, or have it mounted, framed or prepared on canvas. Surveyed between 1912-1923 and first published 1919-1926. Scale is 1:50,000. The original Ordnance Survey Popular Edition series was conceived before, but published just after, the First World War. 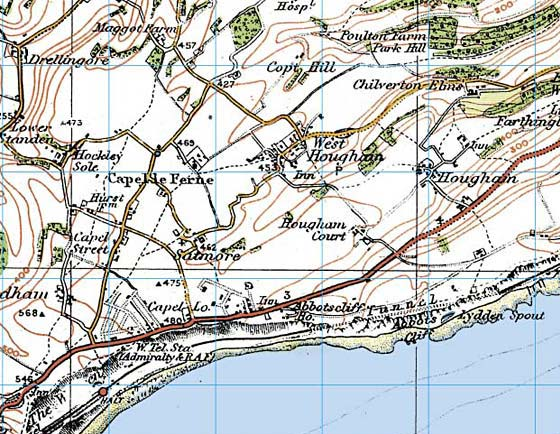 It was the first of Ordnance Survey’s series to be conceived from the outset as a mass-market product, and the first to be produced in full colour. The new technology was put to the test in catering for a wholly new market. These Popular Edition maps show England and Wales on the threshold of great change, capturing the point at which the motor car began to define not only the landscape but also the way in which map-makers represented it. The original impetus behind the creation of the Ordnance Survey and the original Old Series maps had been one of military necessity. Although the maps had soon assumed a more civilian aspect and market, the Ordnance Survey continued to fulfil an important wartime role. During the First World War its normal activities were suspended and over 5,000 people were engaged on military work, producing more than 32 million maps for the war effort. The end of the conflict co-incided with another revolution, as dramatic as that which had swept the country three generations earlier with the advent of the railways – the increased use of the motor car. By the 1920s, this new and independent means of transport had helped create an entirely new market for maps. In 1909, 53,000 cars were registered in the UK: twenty years later there were over a million. Many who could not afford (or did not dare) to use a car cycled instead. Britain already had over 280,000 miles of roads on the eve of the First World War and although these were not of a consistent quality, they were fast being improved. For the first time, the train companies were faced with a real competitor. The post-war years also saw increased social mobility, prosperity and leisure time which helped to encourage Britain’s fledgling tourism industry. Many of the posters and publicity material produced at this time by resorts and transport bodies to attract these travellers rank amongst the finest achievements of British graphic art. More people were travelling than ever before – and all of them, particularly the motorists, needed maps. 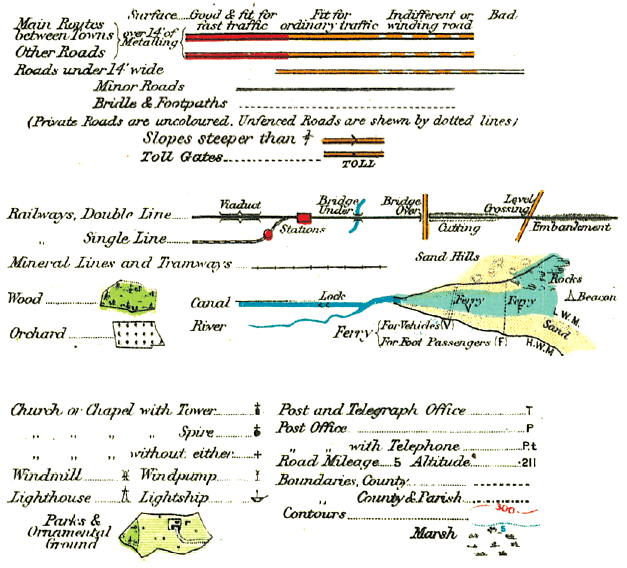 Responding to this, the Ordnance Survey, under the Director-Generalship of Colonel Charles Close, began re-surveying the country in 1912 with a view to producing maps that were both accurate and eye-catchingly designed. After the war, and guided by the results of public consultation, the one-inch Popular Edition was launched, with its iconic cover of a cyclist sitting on a hillside studying a map; a separate 92-sheet Popular Edition series was created for Scotland and published between 1924 and 1932. Some one-inch district or tourist maps focussing on specific towns or attractions were produced from the early 1920s with eye-catching pictorial covers in an attempt to find a wider market. Above key for Popular Edition Maps, as displayed on Folded Sheet Maps. Popular Edition Maps capture the ever-changing landscape of Britain at a crucial time in its history. The inter-war years arguably saw the emergence of ‘modern’ Britain. The patterns of development and transport links these maps reveal are in many cases familiar to the contemporary eye. Much, however, was about to change, in particular the suburban encroachment into the countryside and the further expansion of the road network. The Popular Edition is a potent record of the Britain that was about to be traded for the motor car. By an irony, it also provided the British with their first motoring maps.